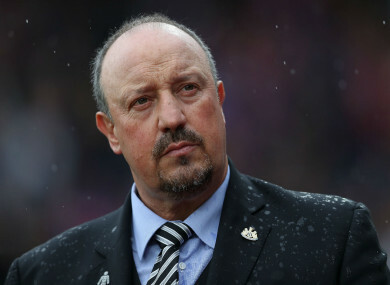 NEWCASTLE UNITED MANAGER Rafael Benitez has been charged by the Football Association (FA) for comments made about referee Andre Marriner in relation to Wilfried Zaha’s request for protection. Crystal Palace winger Zaha said after his side’s 1-0 win over Huddersfield Town on September 15 – for which Marriner was the fourth official – he felt he would have to sustain a broken leg in a tackle for an opponent to be sent off. Benitez responded to that last Friday ahead of Newcastle’s 0-0 draw with Palace, saying the FA should deal with Zaha’s claims and that appointed referee “Marriner will not have this in the back of his head”. The FA has taken issue with Benitez’s naming of Marriner in the build-up to the match. The governing body banned managers from making pre-match remarks about referees in August 2009, saying at the time they were “improper” and would be “dealt with accordingly”. Benitez has until 18:00 local time (17:00 GMT) on 28 September to respond to the charge. Email “Rafael Benitez charged by FA for referee comment relating to Zaha treatment”. Feedback on “Rafael Benitez charged by FA for referee comment relating to Zaha treatment”.